We know a lot of you travel after graduation, whether to blow off some steam or gain new perspectives. Post grad life can be overwhelming, so why not travel if you can? 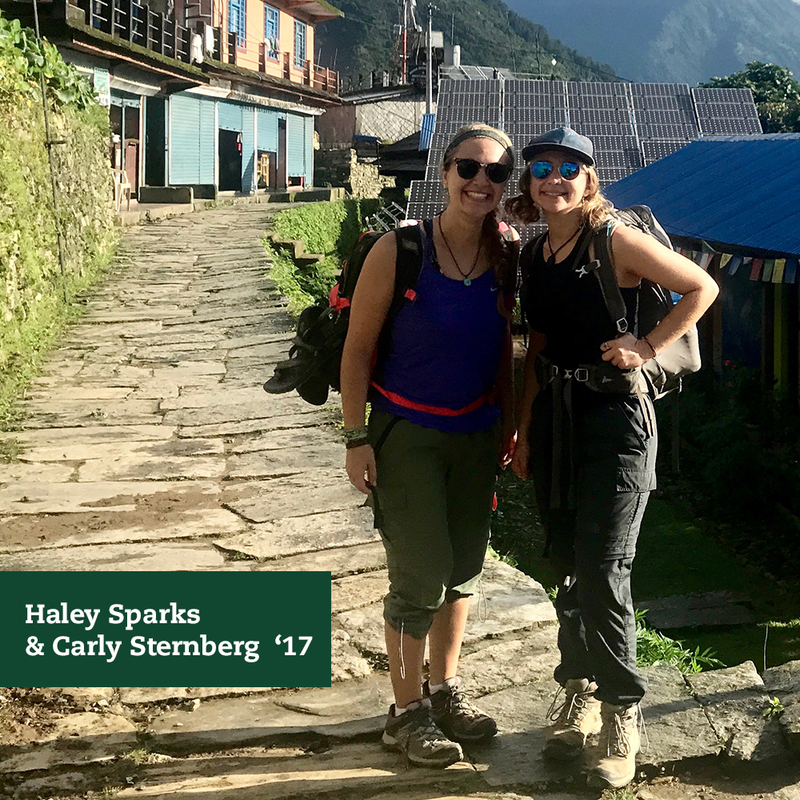 With that in mind, this week we’re telling the story of two UVM alums from the class of 2017 – Haley Sparks and Carly Sternberg, who traveled to South East Asia for three months last summer and shared their experiences below. My name is Haley Sparks and I graduated from UVM in May of 2017 with a major in Secondary Education and a minor in Special Education. In a nutshell, my UVM experience was everything I hoped it would be and more. I loved everything about the school, the atmosphere, the people, and the city of Burlington. I live in Salt Lake City, Utah now and while I like it here, I still find myself thinking of Vermont everyday. Carly and I met freshman year of college and quickly became best friends. After that, we always planned to take a big backpacking trip together after we graduated. 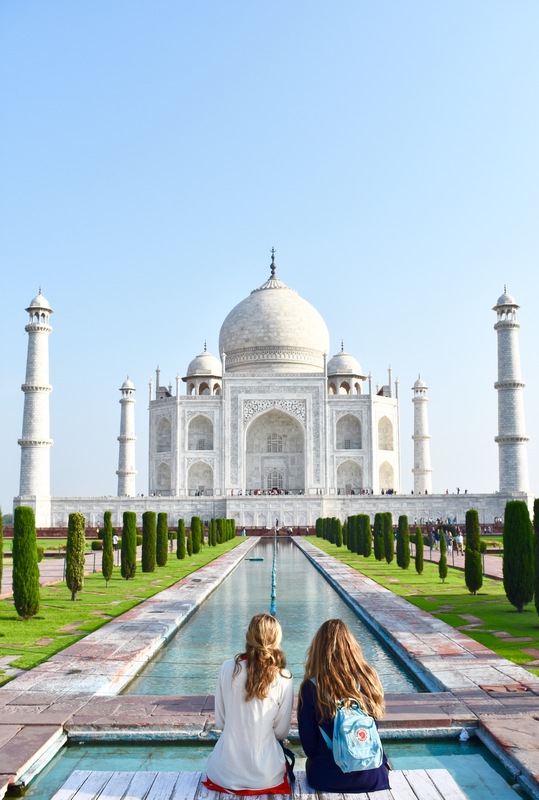 We are both avid travelers and originally wanted to spend some time traveling around Europe, but eventually decided to take 3 months to travel around Asia to visit Thailand, Vietnam, Nepal, India, and Sri Lanka. Carly had spent some time previously in Thailand, but I never had. 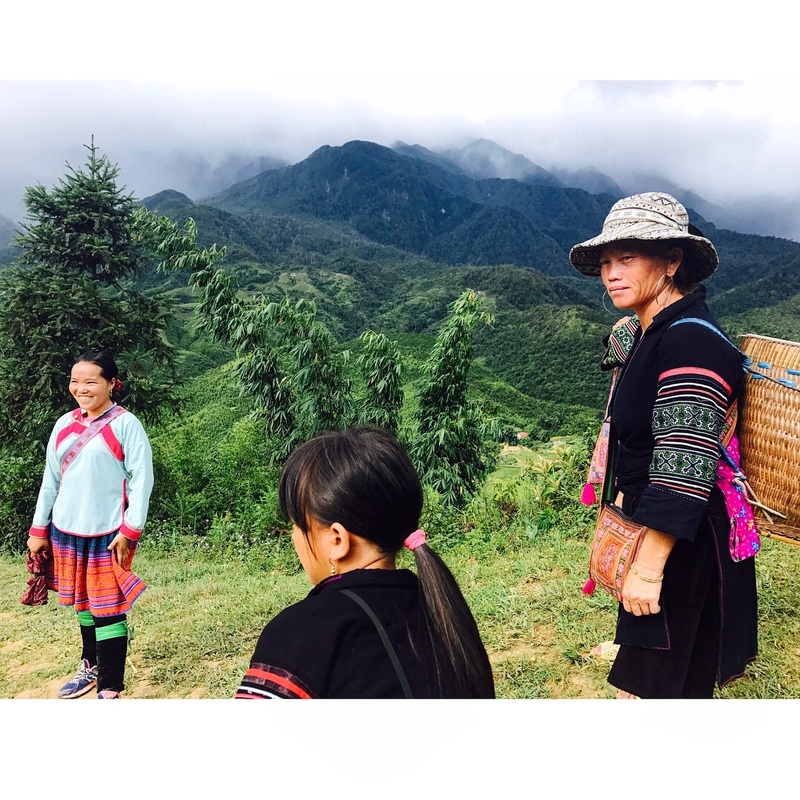 Our itinerary was built as a combination of places we wanted to visit because of their beauty, their people, their food, and the experiences they offered that we knew we wouldn’t be able to find anywhere else. Although 3 months may seem like a long time to live out of a backpack, we both wanted to genuinely experience each country and get a feel for all the places we visited. Planning our trip from July-October and taking our time in each place seemed like the best way to do that. I have zero regrets about taking this trip right after graduating college. While many of our friends were getting ready to enter the “workforce,” we were lucky enough to be buying plane tickets and planning itineraries. 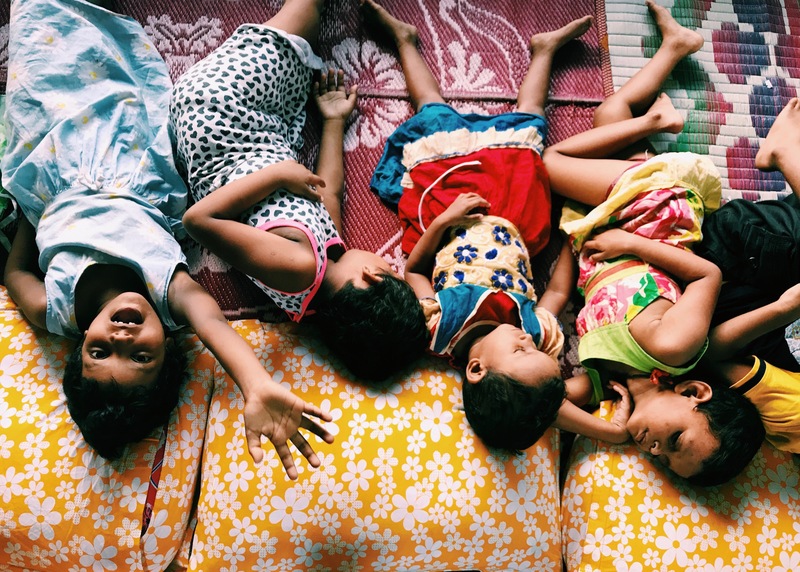 After finishing 4 years of college, there seemed like no better reward than an eye-opening trip around the world. My last semester of college was a busy and stressful one, and this trip provided me the motivation I needed to finish on a strong note. Post graduation also seemed like the perfect time to take this trip because I’m genuinely unsure if there will ever be another time in my life where I will have the ability to take this much time just to travel and enjoy life and the world. Having the ability to design and plan those 3 months of time however we wanted was something I had never experienced before and it was empowering and enlightening. With no restraints such as school or jobs or anywhere to be, we were totally flexible to do whatever we wanted. This trip was a whirlwind and we packed in a little bit of everything. We were lucky enough to experience beaches, lakes, oceans, rivers, mountains, city life, and farm life. Each day was different than life at home, and I find myself reminiscing about it often. Traveling for 3 months out of a backpack taught me to appreciate necessities over luxuries and it taught me how to live with barely anything. Besides that, it taught me that each country we visited was a totally different experience, and whenever we landed in a new place, we had to adjust to a totally new culture. Doing this kept me constantly on my toes and it kept me constantly wondering, navigating, and thinking. It taught me how to interact with anyone, no matter how strong the language barrier might be. It taught me that while the world might seem huge, there is always people that can make anywhere feel like home. Staring at that piece of paper that I received after walking across the stage in front of Waterman last May, the single piece of paper documenting the major in global studies and minors in Spanish and Economics that I had completed, the world suddenly felt more overwhelmingly huge than it ever had before. During my time at UVM, the world sometimes felt like it only extended across Lake Champlain and to the peak of Mount Mansfield. Campus had a way of absorbing me into its super charged atmosphere and making me feel larger than life, part of something that was big and moving forward. With that piece of paper in my hand, all of the sudden it felt like I was in a huge limbo. 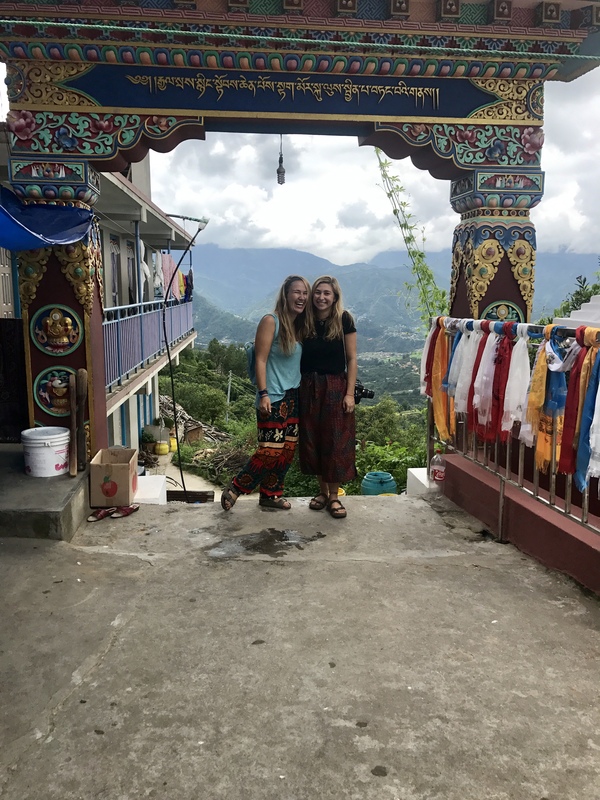 There was nowhere that I needed to be, nothing that I had to be doing, and so I went to roam throughout Southeast Asia for three months with my best friend and I don’t think there could have been a better time to do it. 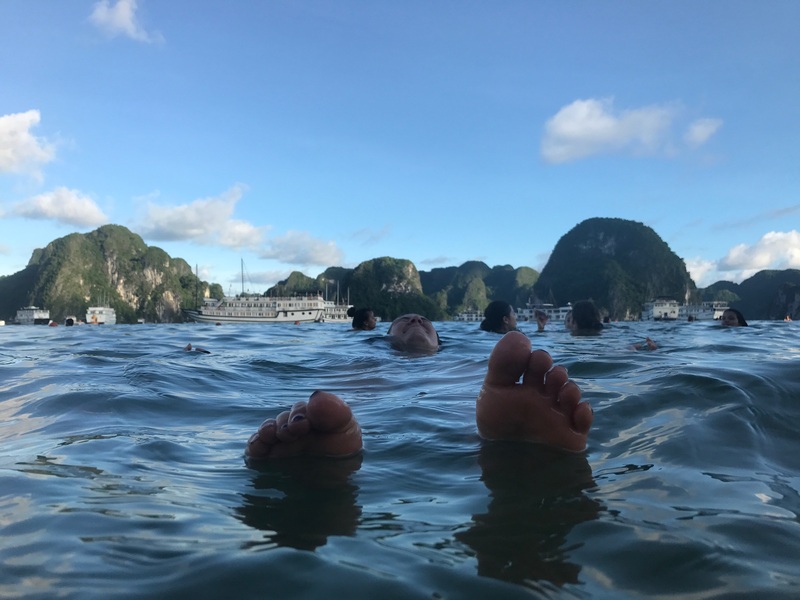 I spent 4 years learning about the world and how we might begin to understand its reality, yet I got a clearer vision of the world and myself over my three months in Southeast Asia than I ever had before. Everyday was brand new. My mind was being stretched to take in all of the sights and colors and smells that I had never experienced before. One day I was stuck knee deep in a rice paddy in the middle of a monsoon, a few days after that I was deciding whether or not to continue on to the Annapurna base camp after my eyes had swollen shut to the size of meatballs, and a few weeks later I was being put in charge of 20 infants in the middle of a red light district in Kolkata. The trip was a shock to the system. Before graduation I was sitting in the library studying for my last set of finals and suddenly felt my heart start to race as I fully grasped the fact that life as it was right then, and as it had been for the past four years would never ever be the same again. The trip showed me that all though this post-grad period can be a bit of a directionless limbo, I’m not stuck and I should never have to feel stuck. The earth we live on is a miraculous place with an infinite number of things happening every second, there are endless possibilities. I learned that even though I have never felt so old, I really am so so young. I learned to trust and have faith in my fellow humans of the earth, and that I am never truly alone. I figured out that this thing called life is forgiving, it doesn’t have to be all that serious, there’s so much room to mess up, to learn, and to grow. So I don’t know what I want to be when I grow up, but I am now living in Salt Lake City, teaching skiing, surrounding myself with new, exciting and beautiful things, and just living life as a 23 year old in 2017, figuring it out as I go. 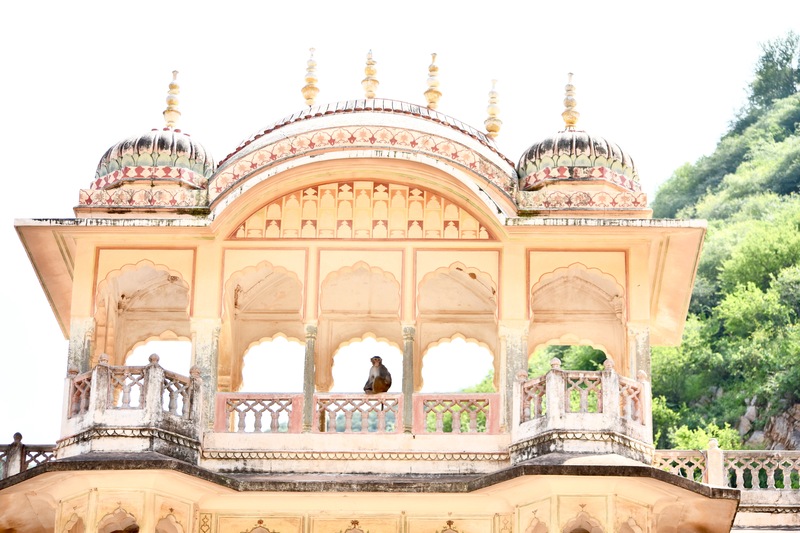 Want to feature your own travel story? Know a friend who might want to as well? Click the button below and refer a friend (or yourself). We’ll see you in the new year! In last month’s survey, we included a bonus question that asked about the funniest part of your first day at your current job. You submitted a ton of hilarious stories and here are some of our favorites. This is worth a few minutes of your Friday. “Nobody at the job returned my emails so I showed up a day late”. “I borrowed a pair of heels from my mom and I could not walk in them and my boss kept asking if I was okay as I got a tour of the office”. “Introducing myself to the Fed-Ex man thinking he was one of my bosses”. “Everyone at my office was so shocked when they heard what year I was born in– one woman said, I thought people born in 1996 were still in elementary school”! “When new nurses all said where they were from and listed Virginia, Maryland, and North Carolina then when it came to me I said Vermont and someone asked, Did you live on a farm”? “My coworker couldn’t think of the word for photosynthesis so she googled “what is it called when plants eat the sun”. “I couldn’t turn on my computer monitor”. “Lost my ID badge already”. “Printed out three I-9s because I messed up the date then the year”. “Getting locked out because I thought that the front door to the building was secured since the handle would not turn. Turns out, I just had to pull the door really hard”. “The child I nanny pooped on me after I thought she was done pooping and took off her diaper”. “I’m a swim coach for the summer and one of my little swimmers lost her tooth. So she handed the tooth to me and hopped in the water like nothing happened”! “Walking in and greeting people just to drop off my sister’s lunch because I’m actually still unemployed”. “Yikes, if only I had a job…lol”. Here at Afterword, we like telling stories. Throughout the year we will bring you a continuing series called My First Year Out about recent graduates (including yourselves), to hopefully inspire and remind you that many UVM graduates take a variety of different paths to success in their first year out. This week we are featuring one of our favorite check ins from last year’s class, Kristen Roche ’17, who took a chance on Portland, Oregon. As her story demonstrates, if you network strategically and keep an open mind about what you want to do, you’ll put yourself in the position to do what you have always wanted (and learn more about yourself along the way). My first year of post-grad has been weird. I can’t believe it’s almost been a full year since graduation. I’ve spent the past year focusing on myself and having fun trying to ‘figure it out.’ Don’t let anyone fool you, though, even if someone looks like they have it figured out…they don’t. After graduation, I packed everything I own into my tiny car, and did the whole ‘cross-country road trip’ thing. I drove from Vermont to Oregon, to start my new life in Portland. In my first five months here, I moved five separate times before finally signing a lease, on my own, in downtown Portland. I got a temp job working at Business Oregon, the State’s Economic Development Agency, helping with the Governor’s trade mission to Japan. After that, I worked as a pizza delivery person for a hot sec…delivering pizzas until 5am at a very punk Portland establishment. Then I was offered a job as a Marketing Assistant for an Engineering firm. What was your biggest challenge, and how did you overcome it? I’m really proud of myself for getting a job that challenges me and sparks my interest. Moving across the country with no connections and zero professional work experience proved to be quite the challenge. You always hear “it’s all about who you know” when trying to find a job, and I knew no one. I joke around that it’s really impressive I moved to Oregon with nothing and could have easily been flipping burgers at McDonalds (nothing wrong with that) but instead found myself shaking hands with the Governor. I overcame the struggle by reaching out to anyone and everyone that was pointed in my direction. You cannot let rejection and awkwardness inhibit you from putting yourself out there. There’s a lot of little details you need to remember; writing thank you notes, making great first impressions, and consistently following through even if your first email gets ignored. It’s important to remember it’s not personal and that people are just busy. It was an emotional roller coaster, and especially difficult when all of my friends and family were back on the east coast. In order to overcome any challenges, I am learning to embrace the experience and accept that life is supposed to be a little weird right now. I’ve learned that I love drinking tea, I hate Doc Martens. And no matter how hard I try I can’t paint to save my life. In the bigger picture, I’ve learned that it is SO IMPORTANT to trust your gut and just go for it – whatever that may be. You really grow as a person and figure yourself out when you put yourself in tough situations. Honestly, I’m thriving as I continue to use different gyms for their free-week promos. I’m learning to not spend $50 every weekend on brunch and which skincare routine works best for me. I’m going out, making new friends and enjoying the fact that random strangers find me interesting and laugh at my dumb jokes. Professionally, I’m a Marketing Assistant for a civil engineering firm. It’s really cool because marketing is done the same across the Architecture, Engineering, and Construction (AEC) industry, so I’ve joined a niche community, SMPS, that I believe will immensely help me to develop professionally. I’m being exposed to a variety of different projects, and I enjoy knowing little details of what’s going on around me. I’m really interested in urban development, so it’s a really good fit. Put yourself in situations that force you to develop people skills and grow your network. Use your youth and ignorance as an advantage and ask for help, because no one needs it more than a recent college grad with absolutely no experience – plus people inherently want to help. Take risks now because even if you fail, you’re still young enough to bounce back. Plus, it’s more interesting if you have adventures to tell stories about later. Think you might be developing your own exciting first-year out story? Know a friend who will be doing something awesome? Click the button below and refer a friend (or yourself). Graduation weekend is upon us, the Class of 2018 is getting ready for the big day, and it is officially your one year grad-a-versary. Congrats! And there are only a few weeks left of Afterword posts for your class, so with that in mind, we are featuring another one of your classmates this week: Cara Stapleford. Cara shares what she has been up to in her first year out and what it’s been like staying in Vermont after graduation. Enjoy! It’s crazy to think that graduation was already a full year ago. This year has been a huge year of growth and learning for me. After graduating in May, I moved to Winooski and worked as a nanny last summer. I love kids and I was really looking forward to it. Unfortunately, it didn’t work out and I ended up quitting but I learned a lot about myself during that time. Although I was bummed (not to mention the fact that I had no income) it was a blessing in disguise because I was able to enjoy the beautiful Vermont summer. I spent a lot of time hiking, biking, exploring swimming holes, and going to concerts. There is really nothing as amazing as a Vermont summer. In September, I began serving in the ECO AmeriCorps program with the Vermont Department of Environmental Conservation. This program places service members at sites around the state that are focused on improving water quality and reducing waste in Vermont. I have been serving at the Central Vermont Solid Waste Management District in Montpelier as their Community Zero Waste Assistant. This program has provided me with so many unique and amazing opportunities. As a part of their outreach team, I assist with waste reduction efforts throughout the district’s 19-member towns. My main project for the year has been to plan and implement a series of Repair Café’s – events where participants can bring broken household items to be fixed for free – which reduces the number of items sent to the landfill and promotes community sustainability. In addition to that, I’ve been assisting with compost workshops, helping to develop a community compost site, and have become a certified Vermont Master Composter. I’ve met some amazing people through this program – professional connections as well as lifelong friends. It’s been an amazing way for me to give back to the community through something that I am so passionate about. As rewarding as this year has been, it has also been really challenging. During my sophomore, junior, and senior year of college, I only had classes on Tuesdays and Thursdays. Transitioning from a 2-day school week to a full time 40 hour per week office position was pretty rough at first. It took me awhile to adjust to that plus a 45-minute commute to and from Montpelier every day. Over time, it’s gotten a lot easier. It also helps that I love what I’m doing. I’ve started taking the bus to and from Montpelier and I bring a book with me. My bus time has become my “me” time. I now treasure my weekends and those occasional days off more than anything. But I have to admit, as much as I have gotten used to it and figured out how to fit in all those other things like going grocery shopping, going to the gym, etc., my laundry normally doesn’t get done until I have absolutely no clothes left to wear. I’ve learned a lot over the past year. I’ve grown a lot both personally and professionally. I’ve learned to let things go. Sometimes that laundry isn’t going to get done or I’m not going to be able to get to the gym everyday but that’s O.K. I’m doing the best that I can trying to navigate the post-grad world. I’ve also really learned how to budget both time and money. Living on an AmeriCorps budget can be challenging but it’s taught me a lot about money management. I can’t take myself out to dinner every day like I’d like to, but I’ve become a really good cook because of that! Right now, I’m just happy that the warm weather has finally arrived! I’m looking forward to another summer in Vermont. I am currently studying to take the GRE and plan to apply to grad school in the fall. I also just applied to be a snowboard instructor for next winter. I have a community garden plot with a friend and we’ve been growing little veggie babies. I love getting my hands in the dirt. My service term ends in August and I’ll be moving to New York but other than that, things are pretty up in the air right now. My advice is that it’s okay to say no to others so you can say YES to yourself more. I’m a people pleaser and a yes person, which can be good and bad. I’ve been learning that it’s okay to say no to others so that I can do more things for myself that I actually want to do. It’s given me more freedom and allowed me to pursue my interests. It’s amazing what you can learn about yourself when you give yourself the time to do so. Know someone who has had a cool first year out? They can be featured on Afterword. 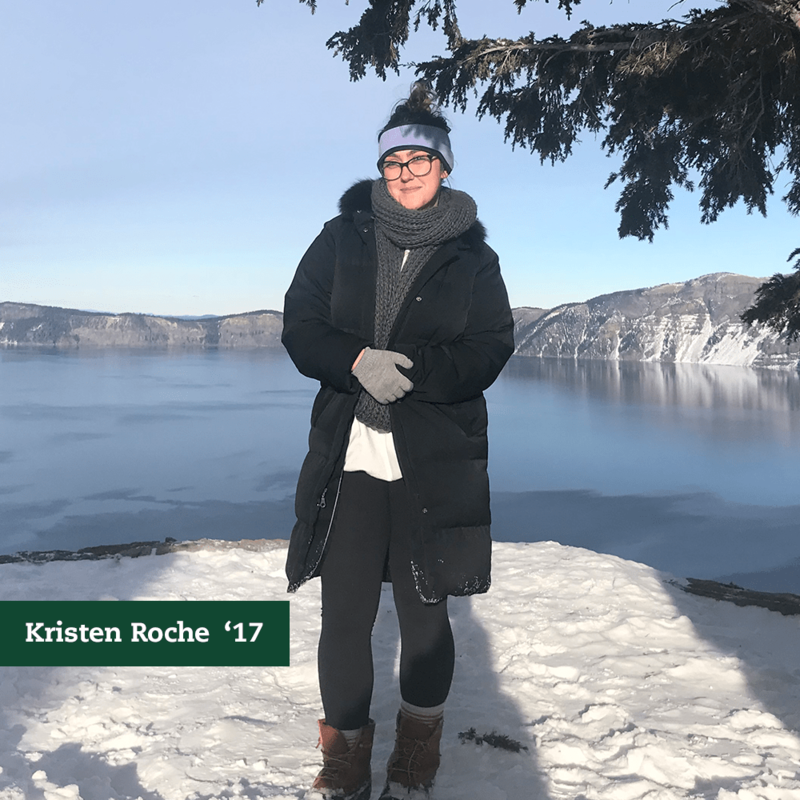 This week we check in with your classmate Kristen Roche, who took a chance on Portland Oregon. Want us to feature your own first-year out story? Know a friend who might want to as well? Click the button below and refer a friend (or yourself).